Guru Nanak dev ji was the first guru of Sikhism. He travelled many countries for around forty years and spread the message of truth, kindness and one god everywhere. He had an enlightened personality. Everyone who came in his contact became his follower. Mardana was his best companion who accompanied him forever. Mardana belonged to Muslim community. Both of them would spend their time by singing devotional songs. Both of them traveled almost all over India on foot. This true story is related to his visit to an ancient holy place named Haridwar in India, which means 'Gate of the Lord'. This place is now situated in Uttrakhand state of India. At Haridwar three holy rivers join together. At that time people gathered there from all over India to take part in a holy fare. The huge crowds of devotees was chanting and praying there. Brahmins were throwing water towards the morning sun to honor people in their families who had died. Guru Nanak ji noticed it and also started throwing water. But he was doing just opposite to others. He was throwing water exactly in opposite direction to sun. People started to notice and gathered around him to see his activity. They were surprised to see this strange activity of Guru Nanak. One Brahmin asked Guru ji about this mysterious activity. Brahmin asked Guru ji, "Why are you throwing water in wrong direction? If you belong to different religion and don't know our rituals than why did you came here?" In reply Guru ji asked him back, "First, you tell me, why you are throwing water to sun?" Brahmin replied, "Sun god is our ancestor, and we are thanking him for us giving blessings for prosperity and happiness." Guru ji asked him again, "So, how far away are your ancestors"? Brahmin said, "Our ancestor live thousands and thousands of miles away." 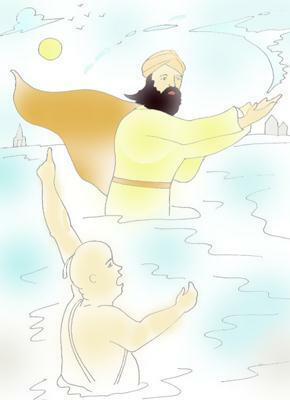 Now guru ji start splashing water very fast again and again towards wrong direction as if he was trying to put out fire. The crowd gathered around surprisingly to see this. The Brahmin cried, "Stop", Stop", what are you doing?" Guru ji replied him, "I have a farm in the Punjab which is in this direction. My fields really need water in this summer season. If I don't get this water over to them, my crops might dry up!" Now the crowd was taking guru ji as a crazy person. One of them asked him, "How this water can reach to your fields in Punjab, as everyone knows that Punjab is very far away from here?" The Guru said, "Well, my farm is much closer than your ancestors. How can water reach your ancestors if it can't even reach my farm in Punjab?" The Brahmans could not understand the meaning of the words of this strange personality but now they were compelled to think over the words of Guru ji. Guru Nanak ji started to read their thoughts and started telling everyone standing there about what he was thinking while throwing water to his ancestor sun. He said to a man, "You were thinking of business you are going to do in Kabul,". The man he pointed at looked very surprised. That was exactly what he was thinking. Then Guru ji pointed to another man and said, "Dear Brahman, you are thinking of your business in Delhi." Guru ji continued, "Pundit ji, you were thinking of how you are going to make money from the people who are coming here today." He knew precisely what each of them was really thinking. Now the men were shocked and defenseless. Guru Nanak ji just proven that their minds were somewhere else entirely when they were praying god. While praying they were absent from the prayer of god by their heart. Though they were the spiritual leaders, but god was absent from their heart and money was occupying it. Guru Nanak had humbled them. The pundit asked to Guru ji, "What should we do?" The Guru said "Sincerely chant Sat Nam and let it fill you with love. Pray from your heart. Be full of God every day and every moment. He advised them to help people, be with them and guide them to the Truth." As these deep words sank in, the men stood there still in silence. Mardana and Guru Nanak continued on their journey spreading truth with love and kindness. 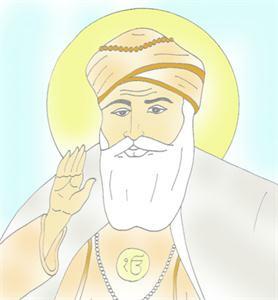 If want to see and work on more images of Shri Guru Nanak Dev Ji than Click on "Coloring pages of Guru Nanak Ji" to get more coloring worksheets. The objective of the story is to remain honest to what you are doing at an instance of the time. Only this is the way to do a work properly and to achieve your target. Let us chant and meditate together with love in our hearts. What does it matter, "what we do or what religion we believe if we don't keep God in our Hearts?" Let us be honest with everyone, and especially with ourselves!